Kensington Palace has announced the birth of an 8lbs 7oz baby boy via Twitter. The new baby arrived just after 11am on Monday weighing 8lbs 7oz. Kensington Palace said that Prince William was present at the birth, and both the duchess and her baby were doing well. The Queen, the Duke of Edinburgh, the Prince of Wales, the Duchess of Cornwall, Prince Harry, and members of both families are "delighted with the news," according to a spokesperson for Kensington Palace. The announcement was also placed on an easel outside Buckingham Palace, as is tradition. It is expected that the Palace will not announce the name of the baby until tomorrow. As is normal we probably won’t find out the new Prince’s name till tomorrow at the earliest, till then he’s an unnamed Prince of Cambridge. Prime minister Theresa May offered her "warmest congratulations" to the duke and duchess on the birth of their baby. "I wish them great happiness for the future," she added. Leader of the opposition Labour party Jeremy Corbyn also shared his congratulations with the Royal family. "I wish them all the very best," he tweeted. Kate was admitted to the Lindo Wing at St Mary's Hospital in Paddington, London, earlier on Monday while experiencing early labour. On Monday evening, a spokesperson for Kensington Palace said the Duke and Duchess wished to thank staff at St Mary's for the care they had received. They also thanked members of the public for their "warm wishes". The world's press have been outside the hospital since, awaiting the brand new royal's first appearance. The duchess gave birth to her other two children at the hospital – Prince George in July 2013 and Princess Charlotte in May 2015. 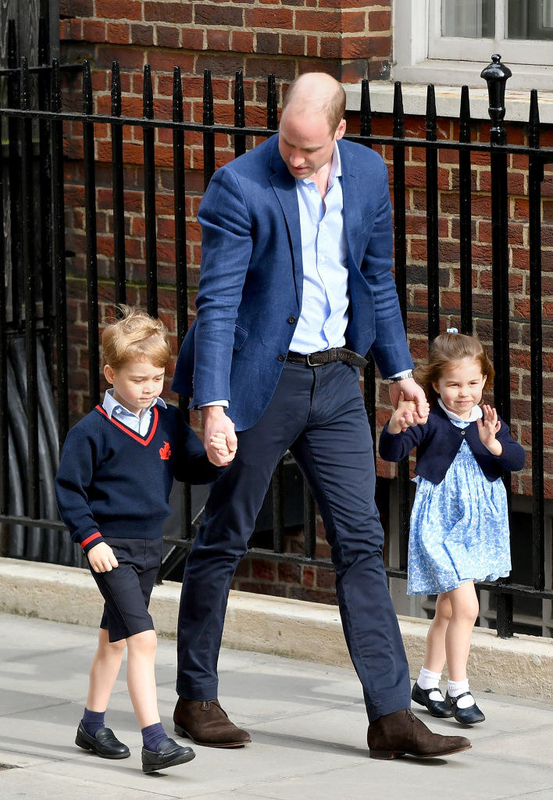 Shortly after the birth of the new royal baby, Prince William arrived at the hospital with George and Charlotte, ready to meet their new brother. In October the palace announced the couple's third baby was due in April, although the exact due date was never confirmed. Royal fans have been camped outside the hospital for weeks in anticipation of the birth. Many also gathered for the births of George and Charlotte. The duchess was last seen in public attending an Easter service with the royal family at the beginning of this month. Her last official public engagement was for a SportsAid event at London’s Olympic Park in March. The road outside the hospital has been cordoned off since last week in anticipation of the latest royal birth. Following the birth of Princess Charlotte, Prince George briefly stole the show as he waved at the beleaguered press on his way into the hospital to meet his new sister. With their previous children, William and Kate had made a public appearance with the baby outside the hospital following the palace's announcement. And this time was no different: They later appeared outside the hospital before being driven away to Kensington Palace. The Duchess of Cambridge was admitted to St Mary's Hospital on Monday, April 23. An earlier version of this post misstated the date.